Occupying the historic Metropole building and with some great views over the River Thames is the luxury Corinthia Hotel London. The hotel offers elegant modern luxury accommodation. Interior design by GA Design International. Became the first hotel to house a Harrods boutique store in July 2011. The Harrods shop can be found in the lobby of the Corinthia hotel. Lays claim to having one of the fastest internet speeds of any London hotel. Bedrooms are larger than normally found in London with bedrooms measuring 30m² to 45 m². Suites measure 108 m² to 470 m². Bedrooms come with Lowe LCD TV, free wireless internet access, a private bar and a Nespresso Coffee machine. Bathrooms are marble and have under floor heating. They also have a separate bath and tropical rain shower. Each of the signature suites takes its inspiration from a great figure in British history including a musician, inventor and writer. Of the 45 suites some are located on duplex floors, inside historic turrets, and feature private lifts and terraces. The 2 bedroom Royal Suite is one of the largest in London at 470 m². Top floor suites look out over the River Thames. There are 7 signature suites with double height ceilings and their own private lift access. Featuring 2 restaurants and a concept cocktail bar called Bassoon (created by David Collins with a sophisticated luxury and 'residential' style). One restaurant is a fish and sea food specialty establishment while the other is an all day new wave British restaurant. The Northall: All-day dining every day of the week in this supremely-elegant modern British grill. Using seasonal ingredients and serving informal menus at accessible prices along with a private fine dining area. Kerridges bar and Grill From Michelin-starred chef Tom Kerridge and Head Chef Nick Beardshaw. The menu which harks back to classic dishes and traditional techniques, and plays on Tom's reputation for serving his take on the UK's most celebrated dishes. Housed in a stunning space reworked by The Studio. The Corinthia Hotel London has an elegant hotel lobby lounge which offers a relaxing environment all day ling for hotel guests. Features a Baccarat Chandelier and overlooks the maple-lined courtyard. The lobby lunge is centrally located with the hotel. A tea sommelier is on hand to advise on the range of teas being served. There is also a luxury spa, ESP Spa (the largest in London at the time of Corinthia Hotels opening) with 23 treatment rooms and is 2140 m² on 4 levels. This includes a state of the art gymnasium with cradio and strength machines, free weights and personal trainers. There is also a Thermal Floor with an Amphitheatre Sauna, Steam Room, Feature Showers, Ice Fountain, swimming Pool, Vitality Pool with various air and water massage jets, marble heated lounges and relaxation bays. The hotel's Victorian Ballroom has a seating capacity for 180 guests while the Court room offers a 100 seat capacity Court Room. Both venues are flooded with natural daylight. Boardroom facilities and entertainment rooms are also available. Nearest: Tube & Railway Station: London Charing Cross 140 yards (128 metres), DLR Station: Tower Gateway 2.2 miles (3.5 km), Motorway: M1 Junction 1 6.4 miles (10.3 km). This hotel boasts 6 tube stations with a half mile radius (0.8 km). In the heart of central London just off from the major tourist attraction of Trafalgar Square. The Corinthia Hotel London puts many of the best known tourist attractions within walking distance. Northumberland Avenue and the area round it, notably Whitehall, is home to many government buildings owing to its close proximity to the Houses of Parliament (house of commons and house of lords) which less than half a mile on Parliament Square. Part of the Houses of Parliament is Big Ben, the large clock house that is a popular attraction in the area. Just 100 yards from the banks of the River Thames. This is a working river with river bus routes, river sightseeing trips and barges keeping the river busy. There is a dedicated walking route along its northern edge and there are many areas so sit and relax watching the passing river traffic. The stretch nearest the hotel is called Victoria Embankment and its here you will the Egyptian obelisk known as Cleopatra's Needle which is some 600 years old. The northern end of Northumberland Avenue is where you will find Trafalgar Square (350 yards). Famous for its pigeons even though the local council have tried to stop their feeding and for the towering nelsons Column surrounding by four lion statues. On Trafalgar Square is the National Portrait Gallery and places to eat. It also marks the south western corner of the West End which is bordered by Oxford Circus, Bloomsbury and Aldwych. This is where the bulk of London's Theatres are located along with the huge selection of restaurants, bars and shops. There are 10 theatres within a third of a mile of the hotel. London's most popular attraction, the London Eye (Millennium Wheel), is just 0.3 miles at the southern end of Westminster Bridge. Its a similar distance to Covent Garden which is just the other side of the Strand and a great place at night with its fashionable bars and covered pizza with two markets open during the day. History: Bought by in 2008 by a group consisting of Malta's International Hotel Investments p.l.c. (IHI) (50% share), the Libyan Foreign Investment Company (LFICO) and Istithmar Hotels FZE of Dubai. Purchased together with 10 Whitehall Place in a $264 million dollar deal. The Corinthia London hotel opened in April 2011 and has regained its former glory having been a luxury hotel in the 1880's (The Metropole Hotel opened 1886). It was taken over by the government during the first world war and then returned to use as a hotel at the wars end. In 1936 it was again leased by the UK government and was used mainly by the ministry of defence until the building was left dormant in 2006. Hit the headlines with a publicity coo in October 2012 by being the base for contestants in X factor, the UK's biggest TV show. Public parking is available in close proximity to the hotel and costs £56 per day. Milesfaster ranking: 3rd from 866 London hotels, and 2nd of 131 five star rated hotels. Another to Consider: Also close by and a similar hotel (0.1 miles, 0.1 km) would be the 5 star Royal Horseguards Hotel, whose lowest rates start at about £182 and which has an 89% guest satisfaction rating. The Royal Horseguards Hotel also offers: free WiFi. Looking for lower base rates? Then another option might be the Grange Holborn Hotel. 0.9 miles from the Corinthia Hotel London (1.4 km), has scored 81% from former guests and whose lowest rates start at about £111 (theres free WiFi too). Something close by with a great client rating? We suggest the 5 Star 41 Hotel may well be of interest to you, it's only 1.0 miles (1.7 km) from here. The 41 Hotel has a perfect unblemished customer rating 100%, a truly stunning achievement. 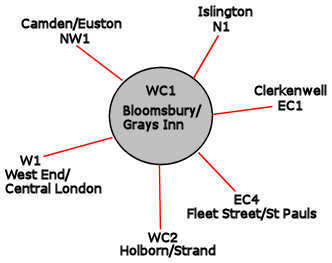 The fifty hotels that are closest to this location (Whitehall Place, SW1 postcode) which we list extend for a 0.7 miles (1.2 km) radius. Consisting of 21 five star hotels (average rating 89%), 19 four star hotels (average rating 88%) and 10 three star hotels (average rating 85%). Of the 50 local hotels top rated are Corinthia Hotel London (this hotel) (5 star), the Haymarket Hotel (5 star), the Covent Garden Hotel (5 star) and the Soho Hotel (5 star) (all 4 are joint top with 99%). Base Rates: We show you the average starting rates (base rates) in the area and break it down by star rating. Trouble with this is that base rates do not include special offers and limited low rate deals. However they remain a useful guide to general rates. The average base rate when considering all hotels in the surrounding area is £192 per night. Starting from £63 at Hub by Premier Inn Covent Garden (3 Star, 90%) with top rates of £438 at Corinthia Hotel London (5 Star, 99%). Rate averages listed by star level: Five Star average: £264, Four Star average: £154 and Three Star average: £112. We rank hotels based on their guest rating but balanced for their influencing factors. We have ranked Corinthia Hotel London 1st (joint) of 50 nearby hotels and 1st (joint) for the 21 five star hotels in the area. Our ranking for sheer lowest base rates is 50th of 50 (21st of 21 five star hotels.). We calculate an overall ranking combining the rates and rating scores. This hotel ranks 5th of 46 for pure value for money (Haymarket Hotel was top). 'Best of the Best' award in the new hotels category 2013.